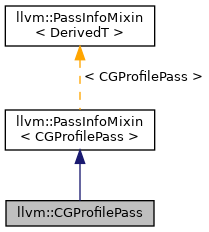 Definition at line 19 of file CGProfile.h. Definition at line 26 of file CGProfile.cpp. References llvm::Module::addModuleFlag(), llvm::PreservedAnalyses::all(), llvm::Module::Append, llvm::AMDGPUISD::BFI, Context, llvm::InstrProfSymtab::create(), llvm::MDBuilder::createConstant(), E, F(), llvm::ConstantInt::get(), llvm::ValueAsMetadata::get(), llvm::MDNode::get(), llvm::CallSiteBase< FunTy, BBTy, ValTy, UserTy, UseTy, InstrTy, CallTy, InvokeTy, CallBrTy, IterTy >::getCalledFunction(), llvm::Module::getContext(), llvm::InstrProfSymtab::getFunction(), llvm::CallSiteBase< FunTy, BBTy, ValTy, UserTy, UseTy, InstrTy, CallTy, InvokeTy, CallBrTy, IterTy >::getInstruction(), llvm::Type::getInt64Ty(), llvm::AnalysisManager< IRUnitT, ExtraArgTs >::getResult(), llvm::getValueProfDataFromInst(), I, llvm::CallSiteBase< FunTy, BBTy, ValTy, UserTy, UseTy, InstrTy, CallTy, InvokeTy, CallBrTy, IterTy >::isIndirectCall(), llvm::TargetTransformInfo::isLoweredToCall(), and llvm::SaturatingAdd().